Julie joined the team here at BRS Architects in 2013. 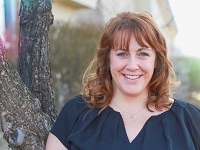 After graduating from the University of Idaho with a Bachelor’s of Architecture in 1997, she spent two years as a member of AmeriCorps*National Civilian Community Corps before moving to Boise to begin her architectural career. Her diverse design experience includes commercial tenant improvements, restaurants, office buildings, retail box stores, educational facilities, residential houses, historical remodels, and master planning. Beginning with her thesis in college, Julie’s passion for sustainable design has been an integral part of her approach to the design process and she relishes the challenge of incorporating these materials and methods into her projects. In the words of Mahatma Gandhi, Julie believes that you should “be the change that you want to see in the world”. This belief is evident in her design principles and everyday way of approaching life. Her free time is spent volunteering, playing softball and volleyball, camping in the great outdoors, and enjoying a glass of wine.